Hi my name is Brian Lankshear and I have operated in the timber stain market for the past 20 years. Over the past 10 years Timbakote® has had applications on over 2400 houses. Here are just some of our client testimonials. A large proportion of this work has come as a result of Timbakote being successfully specified for the job. If you are a specifier yourself and are considering Timbakote then just complete the form below to receive some additional product information and samples all custom created to ideally suit your projects requirements. Timbakote has developed coating systems to offer longer-term durability then your traditional penetrating stains or oils. The coating systems offer durability of 5-10 years, saving frequent recoat dollars for your clients. Substrate, colour, re coat frequency, exposure and stain choice all play a part in the selection of the best stain coating for the job. In choosing a stain coating system durability Vs dollars is an important consideration. 3 coats to Interior timber joinery, walls or ceilings. Do you want a sample colour sent free of charge? If so what colour would you like? 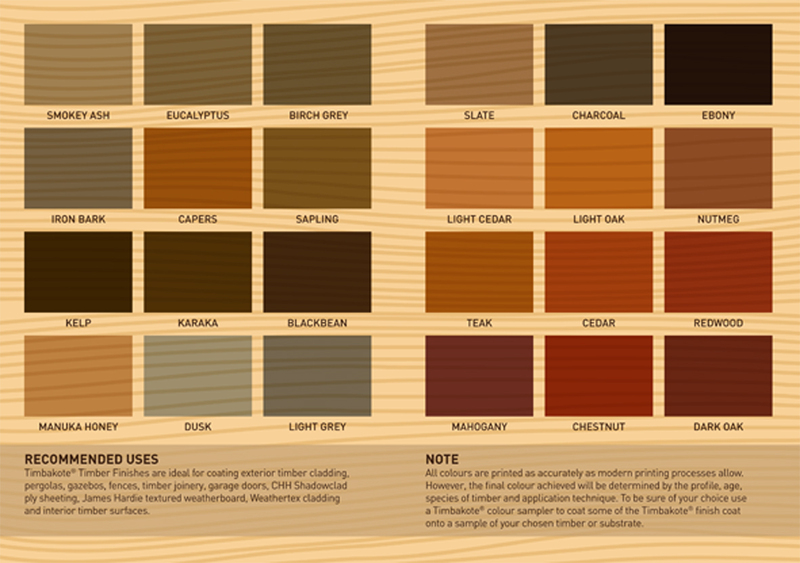 See our Colour Chart for a guide.